‘The Cider Barn‘ nestles in 5 acres of landscaped grounds, ponds and orchards on the ‘Rashleigh’ Estate (once home to ‘Daphne Du Maurier’). It lies on the Saints Way between the renowned scenic Estuary Town of Fowey and Polkerris Beach, one of the finest, safest beaches on the south coast of Cornwall, both within easy walking distance. This ancient Barn only completed conversion in May 2018 . The renovations have been sympathetic, retaining many original features, yet incorporating the latest modern designs and technology. Internally the property will be furnished to the highest standard, using predominantly reclaimed timber, fashioned into unique/bespoke pieces. The ground floor is a spacious open plan design, including a fully equipped modern kitchen, a stunning dining table that comfortably seats 16 and a large lounge surrounding the wood burning stove. Also on the ground floor is a spacious TV room and Utility room at one end and Double Bedroom 8, with en-suite shower room at the other end. The bespoke open tread staircase rises to the first floor bedrooms. There are 6 double beds. with en-suite shower rooms and a further double bedroom with master bathroom opposite incorporating a free standing bath. Outside there is a south facing landscaped area with a well equipped outdoor kitchen with wood fired Pizza Oven, Games Room as well as an outdoor shower and various seating and lounging areas. The indoor pool is heated all the year round and located adjacent to the barn with an outdoor Hot Tub. There is a wonderful grass area full of specimen trees and scenic valley views and ample car parking. 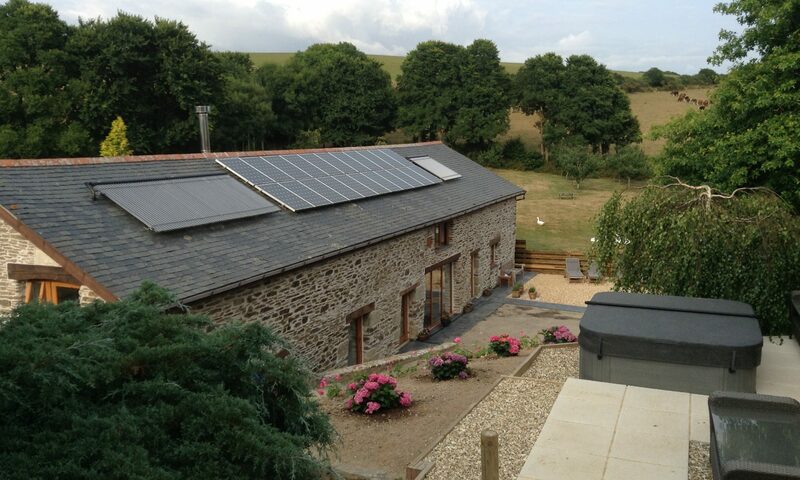 We think this is the first ‘off grid’ conversion property of this size. It is completely self-sustainable. We have our own spring water supply (Great Mineral Water straight from the tap) and we heat all our own hot water (including enough for the 16m long Indoor Heated Pool), produce all our electricity and have installed a state of the art wood burning stove (using all our own wood grown in the grounds), just in case Cornwall’s renowned warmth and sunshine should let us down. Open plan kitchen, equipped with 2 ovens, 2 dishwashers and microwave. Utility room, washing machine, tumble dryer, . Coat hanging space and boot store. 2 lounge areas with log burner. Dining table that seats 16 people. Large grounds of over 2 acres. Indoor heated swimming pool Hot Tub and Outside Shower. Outdoor kitchen with Pizza Oven, Wine fridge, sink.